President Trump received 92% bad press, vs. just 8% good press on the ABC, CBS and NBC evening news shows in the month of September, according to a study by MRC news analysts. Since Inauguration Day (January 20), the broadcast networks have tilted 90% anti-Trump, vs. 10% pro-Trump, not counting partisan statements or neutral/informational coverage. (See our methodology statement at the bottom of this article for details.) Regardless of the topic, there has been little variation in the negative tone of coverage each month. These six topics accounted for two-thirds of the administration’s TV news reports in September. While the North Korea crisis received the most attention, this was also the topic with the fewest evaluative comments — just 20 during nearly an hour of coverage — which translates into a large percentage of neutral coverage. The networks focused most of their evaluative coverage on immigration, the NFL and the private jet flights of cabinet officials (especially Health and Human Services Secretary Tom Price, who resigned September 29). Not surprisingly, 100% of the coverage of the expensive jet flights by Cabinet officials was negative. Nearly all (96%) of the coverage of the administration’s immigration policy was negative. On September 5, for example, CBS Evening News anchor Anthony Mason framed the President’s decision to end the Obama-era DACA program as “a dream lost for thousands of undocumented immigrants,” while a subsequent story by correspondent John Blackstone focused only on the negative reaction of those who benefited from the policy. A CNN poll taken in late September found more Americans (49%) said players who knelt during the National Anthem were doing the wrong thing, compared to 43% who said it was the right thing. Yet broadcast evening news coverage of this topic was slanted about four-to-one against the President, with 59 comments criticizing him (81%) vs. 14 in support (19%). And, while there were few evaluative comments about Trump’s response to Irma (just four, three of which were positive), the networks transmitted 29 negative statements about his response to Maria, vs. just 2 positive comments (yielding a 94% bad press score). Using these criteria, MRC analysts tallied 393 evaluative statements about the Trump administration in June, July and August, of which 361 (92%) were negative vs. 32 (8%) which were positive. Since Trump took office on January 20, there have been 4,537 such evaluative statements, of which 4,073 (90%) have been negative, vs. 464 (10%) which have been positive. 1. What is the role of the media? 2. What type of bias do ABC, NBC and CBS display when reporting on President Trump? 3. An October 6 Rasmussen poll showed that 46% of likely U.S. voters approve of President Trump’s job performance. Fifty-three percent (53%) disapprove. Do you think the number would be different if news reports on President Trump were more neutral (if they just reported on what he did/said without slanting the coverage)? For example: A CNN poll taken in late September found more Americans (49%) said players who knelt during the National Anthem were doing the wrong thing, compared to 43% who said it was the right thing. Yet broadcast evening news coverage of this topic was slanted about four-to-one against the President, with 59 comments criticizing him (81%) vs. 14 in support (19%). 1. The role of the media is to inform the public as honestly, fairly, and accurately as possible about news crucial to a democracy. 2. 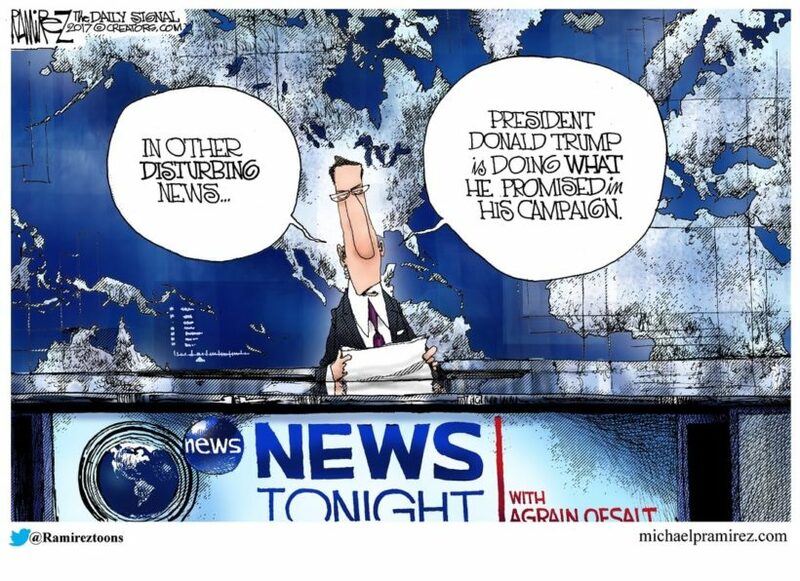 ABC, NBC and CBS display bias by spin when reporting on President Trump. Also, selection of sources.